Home » Cloud » Hostgator Cloud Hosting Review, Coupon, and Features! Here’s my complete Hostgator coupon code list. You can find different types of discounts for cloud hosting, shared hosting, and VPS hosting as well. Also, here’s a table comparing cloud hosting pricing from various vendors including SiteGround, Hostgator, Bluehost, and A2 Hosting. The discounts drop as the billing cycle shortens. 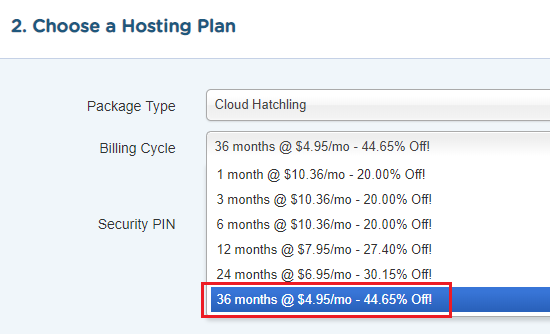 Except for the points mentioned below, Hostgator’s cloud hosting has the same features as the equivalent shared hosting plans. For the differences between the two, see below. In normal web hosting, all your data resides on a single server. This means that if something were to go wrong with it, your entire site would drop dead. Hostgator cloud hosting however, distributes your data across a cluster of servers. There are always three copies of your data stored in the cloud. So if one server fails, another one can take its place. This failover is instantaneous and you won’t even notice that anything happened. That’s pretty cool! However, it does not mean that your data is spread out across multiple locations across the globe. It’s not a CDN. See below for more information. This is known as a “reverse proxy” and is similar to how Cloudflare functions. However, these resources are still shared, and not dedicated. For proof, see further below for the difference between Hostgator cloud and VPS hosting. So it’s not like a VPS where you get these juicy resources all to yourself. Maybe it means there’s a lower number of people sharing these resources with you? I’m not sure, and Hostgator hasn’t released any data about this. So take this claim about “4x” more resources with a grain of salt! These are quite useful to have – especially the page-load speed metric. The RAM and CPU usage is great to know whether or not your site is exceeding its limitations. With traditional shared hosting, Hostgator is very cagey about things like RAM and CPU. All web hosts oversell their servers, and Hostgator is no different. But with Cloud hosting, it seems that they’re much more clear about how much RAM/CPU your site is using. Do I Get Free SSL with Hostgator Cloud Hosting? Yes. As of July 6th 2018, Hostgator now has free SSL for all its plans. That includes cloud hosting. Before, there were distinctions between the various plans, but now it’s available for everyone. This is a standard Let’s Encrypt certificate, and not a “positive SSL”. If you want the higher tier of SSL, you should sign up for the Business Cloud plan, which includes it by default. Is my Site Hosted in Multiple Locations with Cloud Hosting? In fact, there is no easy way to mirror your site like this across multiple geographical locations, short of creating a load balancer with something like DigitalOcean, or configuring one yourself with Google’s Cloud Compute or Amazon’s AWS. A feature like this is not trivial, and will certainly never be found in a hosting plan costing just a few dollars a month 🙂 . So if anyone tries to tell you that standard “cloud hosting” means your site is free of geographical restrictions, they’re either lying, or don’t know what they’re talking about. Does Hostgator Cloud Hosting Come with a CDN? Unless you choose one of these options, there is no CDN functionality with Hostgator Cloud Hosting. Personally, I feel that Cloudflare is the best CDN – and it’s free! Can I Purchase Additional RAM or CPUs? 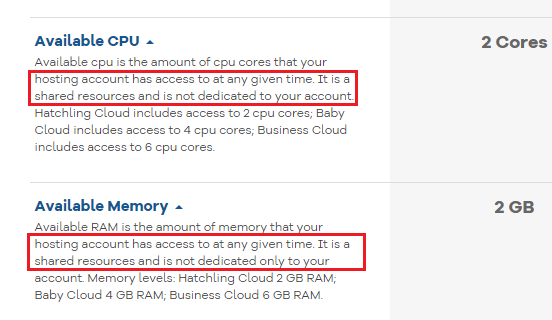 If you read the specs for RAM and CPU on the Hostgator cloud hosting page, you might feel there’s no difference between that and VPS hosting. After all, the CPU and RAM seems to be around the same, and cloud hosting is much cheaper! So it’s obviously the better option, right? With a Hostgator VPS plan however, you have exclusive access to your resources. So it’s faster – much faster. And also why it’s more expensive! That makes sense right? How to Transfer to Hostgator Cloud Hosting? If you’re currently on a shared hosting plan, you can migrate to cloud hosting by logging in and filling out the Hostgator transfer form. This will let you choose what you want to change it to, and take it from there. Is Hostgator Cloud Hosting Worth it? I would say that Hostgator cloud hosting is worth it, yes. It’s marginally more expensive than shared hosting, and comes with a bunch of benefits like a varnish cache, and the capability to expand and view your resource usage. Also, your data is more secure since it’s spread out across a cluster of servers. While it doesn’t include a CDN, or have other features like multiple location hosting, that’s only to be expected. These are usually additional service features that you should expect to pay a premium for. It doesn’t take away from the benefits of the Hostgator cloud hosting plan itself.